Message 1378658 - Posted: 8 Jun 2013, 20:03:56 UTC - in response to Message 1378655. It looks like you are up and running. OBTW this question probably is better for Number crunching forum. Message 1378723 - Posted: 8 Jun 2013, 23:01:00 UTC - in response to Message 1377332. I'm very curious about it! Message 1378764 - Posted: 9 Jun 2013, 3:12:48 UTC - in response to Message 1378650. If the intended recipient of the signal knows what period is used for delaying the combined copy of the signal, that can be used to enhance reception. We don't have that knowledge, but we can examine signals to see if thay have a delayed component and put the measured delay in the science database so if it is seen again from the same sky pointing maybe the signal is intentionally being sent that way. IOW, it's a new kind of signal search rather than increased sensitivity. There have been other improvements incorporated in v7. The stock CPU application has functions using the AVX instructions on systems which support them, and use a newer and more efficient version of FFTW too. There has also been work done to tighten the accuracy of some calculations which should reduce the number of inconclusive validations between results produced by CPU and GPU. That won't be obvious, many of the inconclusives are caused by systems which are temporarily or perhaps permanently unstable, and others when there's an overflow are caused by different processing order. I read somewhere, after I kept getting messages about no GPU, that the new version BOINC or Seti7 needed a graphics of 2.2 and my GTX 550 Ti is only 2.1. This means no CUDA processing. Is it possible to get the earlier version as it seems crazy not to use the GPU, even if it is not as quick. Message 1379456 - Posted: 10 Jun 2013, 17:23:03 UTC - in response to Message 1379348. The one with the i7 processor i assume?!?! Goto nvidia.com and download the latest drivers for your 550, that will most likely be the problem as there is no gpu being detected on that computer. Message 1379556 - Posted: 10 Jun 2013, 19:59:57 UTC - in response to Message 1379456.
he could try updating the Nvidia and Intel Graphic drivers on that host too. Message 1379976 - Posted: 11 Jun 2013, 19:02:46 UTC - in response to Message 1379456. If he's running Win7, every time he restarts the computer, he needs to open Boinc Manager, go to File > Exit, wait a minute, then start it again. Boinc doesn't detect GPUs when it autostarts in Win7. I think this is the same thing Claggy just said, only I put it a way a "not computer savvy" person can probably understand. Message 1380024 - Posted: 11 Jun 2013, 20:37:34 UTC - in response to Message 1379976. Yes it is an HP with i7-260, running WIN7 64. I have tried exiting BOINC and restarting. I now await to see if any CUDA data appears. I am running Milkyway, Einstein and Seti. Thank you for the info. Fingers crossed. Message 1380029 - Posted: 11 Jun 2013, 20:44:03 UTC - in response to Message 1379556. Just noticed your reply, I only saw the later ones. I do remember an option on the latest upgrade install which seemed to suggest a better install option. Your comment seems familiar. It didn't really understand what it meant, but i did not think that there would be an option that would cause problems. "Or it could mean he's done a Boinc Protected Application Execution installation (aka a Service installation)"
Again your help would be appreciated. I only want the prog to run as it used to. Message 1380033 - Posted: 11 Jun 2013, 20:52:23 UTC - in response to Message 1380029. Did you click Service Install? Message 1380112 - Posted: 12 Jun 2013, 2:55:57 UTC - in response to Message 1380033. Ah yes Ageless, I saw the increased protection, obviously missed (HOW?) the not use graphics card ! I hope there is an easy way out. It is a good job there are people like you who are knowledgeable ! Message 1380135 - Posted: 12 Jun 2013, 5:56:43 UTC - in response to Message 1378642. Please give us back v6! IMO, since V7 does so much more going back to V6 would be the waste. The gentleman originally being quoted does not apparently realize that the basic science being performed on the data is now different. So comparing 'performance' of the two types of tasks is irrelevant. I am looking forward to his return with the CUDA application re-written in hand-crafted assembler code. If he can achieve that, then he will have earned the right to say every word he's written. But I'm reminded of a certain other purveyor of vapourware, who promised that he could write code that would run on his employer's CPUs faster than any GPU. Sadly, it never happened. Yes, I remember said purveyor. Message 1380239 - Posted: 12 Jun 2013, 12:21:44 UTC - in response to Message 1380112. Message 1380273 - Posted: 12 Jun 2013, 14:19:43 UTC - in response to Message 1380239. Note that this procedure is safer than it sounds. 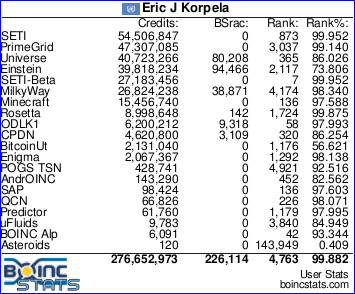 Although the uninstall/reinstall process will remove and replace your BOINC programs, all your SETI information, like tasks in progress and account statistics, are kept in a separate place and will be unaffected - likewise, any other projects you are crunching for. Message 1380343 - Posted: 12 Jun 2013, 17:01:08 UTC - in response to Message 1380273. I used computers in the 70s original Commodore PET (still got it somewhere) with an upgrade to 32k dynamic RAM overlay board and addition floppy drives and Apple spec printer with Commodore interface, bought in USA in 1980. and then BBC B. Both in basic (BBC very good with procs), and some assembler. Now however I am lost. I used also to be able to strip down an engine. Now have problems removing the engine cover! Underneath, your guess is as good as mine. Anyway thank you all. It is really nice to see that there are still helpful friendly people out there. Message 1380357 - Posted: 12 Jun 2013, 17:11:13 UTC - in response to Message 1378554.
https://setisvn.ssl.berkeley.edu/svn/branches/sah_v7_opt for optimized and GPU versions. Message 1380429 - Posted: 12 Jun 2013, 20:27:16 UTC - in response to Message 1380343. Message 1380461 - Posted: 12 Jun 2013, 22:22:32 UTC - in response to Message 1380429. IIRC, a C-64 has composite video out.